This item was introduced in E-Prime 2.0 (2.0.8.9). 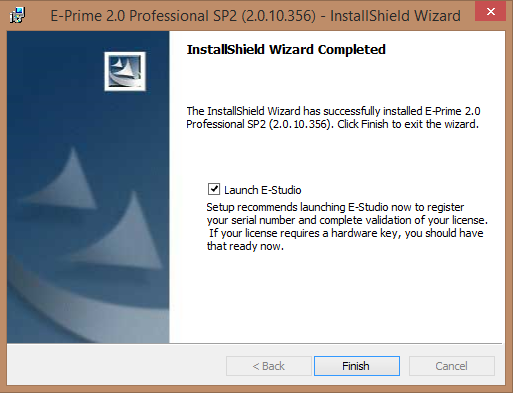 The E-Prime installation provides the ability to automatically launch E-Studio at the successful conclusion of an installation. Automatically opening E-Studio at the end of the installation provides the immediate ability to validate the license for the machine. The ability to avoid running E-Studio at the end of the installation can be accomplished by unchecking the box. NOTE: The version number on the image may not correspond to the version you are installing.